Synopsis: Professor Sewell, leader of a biological research team, is poised to announce some important results concerning the control of epidemics. Before he can do so the government steps in and forbids publication of the work, worried that unscrupulous foreign powers might use the information to spread, rather than prevent, epidemics. One of Sewell’s juniors, Bob Marriott, decides to take matters into his own hands. Encouraged by Ivor Gates, a crippled ex-soldier and the fiancé of one of Marriott’s colleagues, Marriott plans to leak the work to a shady acquaintance of Gates who claims to represent a body that will disseminate the work clandestinely. MI5 step in, and a time-sensitive chase across London is launched to prevent Marriott from committing treason. Context: If, as Clive James has suggested, Balchin originally intended this novel to come out in 1945 (before Mine Own Executioner) then it is reasonable to assume that the material for A Sort of Traitors was gleaned during Balchin’s wartime work for the army. Verdict: In my opinion, the book is hampered by the fact that it is rather too long and has a relatively weak ending. It doesn’t quite stand comparison with the wartime books that Balchin wrote in a similar vein, although it is certainly thought-provoking, very humorous in places and, of course, addictively readable. 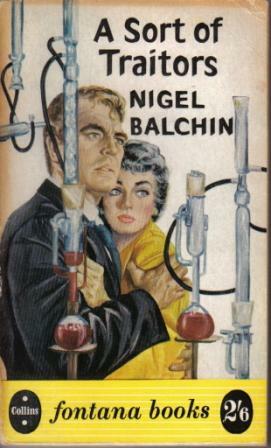 Availability: There were several paperback editions of this novel so second-hand copies should be quite easy to obtain.